Information are like right in front of you, just got to read some other parts of these forums. I ran a search of the term "Apex," and I got tons of relevant results. Try using the search button next time, ok ? Would be an aweful waste of space to put that search function up there for nothing, no ? Excel...don't you know any good Japan racers? 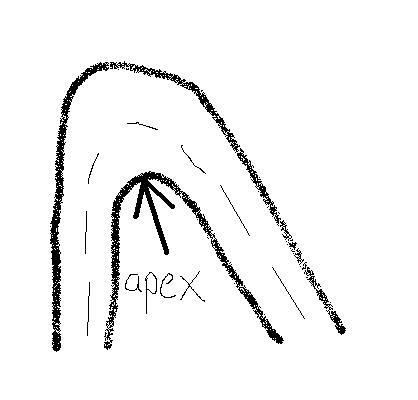 very rough representation of a right hairpin, the apex is like the point shown in the pic, had to put the dots in to stop it from deleting the spaces in the middle. For a clearer pic click on the attachment pic. ^^he has a bro...how old is he? is he good? yea hes got a bro elite. hes like 11, and he doesnt pwn like his bro..just..mediocre. ,Mar 9 2005, 08:14 PM] yea hes got a bro elite. hes like 11, and he doesnt pwn like his bro..just..mediocre. omfg!!! thats soo weird i was thinking of starting a thread just like this one yesturday. no f**king joke thats soo weird.... well since im japanese i know sum crazy people from there. Hyde, iiteyoshi,9.6 those are the main ones. o and one more term that should definatly be in here PWN. PWN or PWN'D basically means u just got owned ( figured u know wat getting ownd is). idk y but i say tizzowned. how many white auras does he have? mrs DOESNT HE HAVE WHITE AURA TOO ON THAT? don't forget about that one RX-8 driver from Japan who got 2'57 on Iro and owns other RX-8 records. i believe some people also use the term fishing to describe the act of beating a less skilled player by just a bit in hopes of them rechallenging you. if they rechallenge you, then they have taken the bait. OK, I added the guys from Kanda to the Asia part, cuz they do deserve credit for all the crazy vids they made and released. finally the thread i'd been waiting for.